Yesterday while wasting time in the Biology Office, I was talking to Joe Berger. He’s a University plumber, and he often drops by the office to hang out. Particularly on Friday, also known as “admiration day,” because it’s the day you go around and admire the stuff you got done during the week. Anyway, he mentioned living somewhere near Allenville, and driving out the Allenville road from highway A. Wait a minute. Cross the diversion channel? 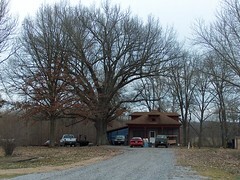 For those not familiar with Swampeast Missouri, around the turn of the 20th century some landowners got together and developed a system of canals, etc. to drain the southeast corner of the state. Prior to that it was an enormous wetland, on a par with the Everglades; now it’s cotton, rice, beans, etc. An ecological catastrophe, but completed long before anybody thought that wetlands were good for anything. Anyway, on a bicycle, if you want to head south from Cape Girardeau, you have a problem. There’s a big canal, the Diversion Channel, that runs west to east just south of Cape, and the only crossings I knew of were I-55 (no bikes) and MO 25 (rideable, but insane traffic). Needless to say, I was excited about the prospect of a paved county road crossing the diversion channel. So today I drove down to Highway A and rode down the Allenville road. Above you see the bridge. Okay, not the greatest photo. I used the “timer exposure” setting and set the camera on the ground. 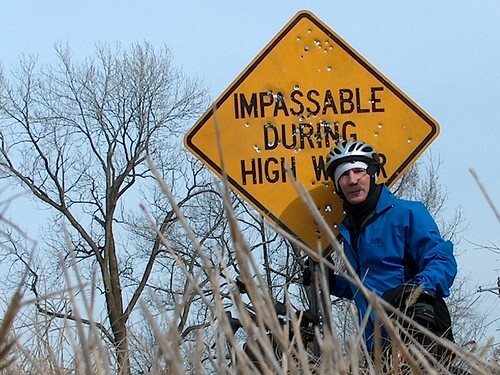 Still, you can see the bullet holes in the sign. 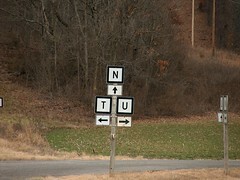 NUT junction, where Missouri highways N, U, and T come together. BTW, U crosses the diversion channel just to the right of this view. In fact, I later found that CR253, just west of Whitewater, also crosses the diversion channel and is also paved all the way. So, a big day for Southeast Missouri biking. 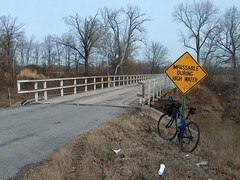 This entry was posted on Saturday, January 20th, 2007 at 4:21 pm	and is filed under Bicycling, Missouriana. You can follow any responses to this entry through the RSS 2.0 feed. You can leave a response, or trackback from your own site. Wait. WHY are there bullet holes in the sign? It’s not like they tried to impose the metric system or anything. Because signs are for target practice? Around here they certainly are… BLM signs more than others, but any sign is fair game (as it were). Yeah, it’s like mountain climbing — “because they are there.” I don’t think it indicates any particular animosity toward warning people about high water. I thought that kind of thing didn’t happen in this day and age. Live and learn! K — You live across the pond, and probably forget that here I can go to my friendly local Wal-Mart and buy a gun. Out in the sticks, everybody has a gun or two or three, and shooting at random stuff is a common form of amusement. 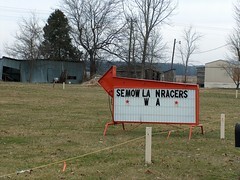 Perhaps this is what people do in Allenville when it’s not lawn mower racing season. Can you get raccoon urine at your Wal-Mart too? We could in northern Michigan. One-hundred percent pure raccoon urine, mind you–none of that synthetic crap. You know, I haven’t shopped for raccoon urine recently, so I’m just not sure. Next time I’m at Wal-Mart I’ll have to look for it. Haven’t seen raccoon urine here in NV. The most popular urines in the eastern Sierra Nevada are fox, coyote, and bobcat. Typically, these are available at fine garden centers. Bobcat scented roses are less attractive to deer and rabbits, and a lengthy list of other creatures with an intact olfactory organ. It’s right next to the Hands Free Fawn Bleat. I should think that, as one of those “creatures with an intact olfactory organ,” I would also find bobcat-scented roses less attractive. Sort of defeats the purpose for me.